If Endre Ady (1877-1919) by accident had finished his career as a poet after the publication of his first two volumes, his name would be known today only to some specialists. However, his third volume of poetry, the Új versek (New poems) shook the “Hungarian fallow land” (as he calls his milieu) with the force of an earthquake, sharply dividing the literary public among the enthusiastic followers and the no less enthusiastic haters of him. The official, gentry-spirited Hungarian public that had been educated on the poems of Sándor Petőfi and János Arany were shocked by the modern poetry of Ady, but youth and the radical bourgeois opposition immediately adopted his name as a battle-cry. Nevertheless, his poetry, just like his personality was an extremely complex phenomenon that cannot be squeezed into the Procrustean bed of political stereotypes. An excellent example for the complexity of Ady’s world is his article Vallomás a patriotizmusról – Confession on Patriotism. The Confession was published in the October 1913 edition of Szabadgondolat (Free Thought). By clearing up the forces behind this little known journal that was published in a small number of copies we also find some points of reference to the interpretation of the article. The Szabadgondolat was the official journal of the Association of Hungarian Free Thinkers, founded in 1905 and of its member associations, the Galilei Circle, the Harkány Circle of Budapest, the Association of Free Thinkers in Arad, the Darwin Circle in Nagyvárad (now Oradea in Romania), the Martinovics Circle of Eperjes (now Prešov in Slovakia), the Batsányi Circle of Kassa (now Košice in Slovakia) and the Ferrer Circle. 1 The more knowledgeable will find out just from the names mentioned that the Szabadgondolat was a journal of freemasons. It is, however, not widely known that Ady was a member of the committee of the Association, and he even entered among the freemasons. 2 For a better understanding of the poet’s decision let us have a glimpse on the situation of Hungarian freemasonry at the turn of the 19th and 20th centuries. Ady did not delude himself. He knew that in a situation of danger when the destiny of the Hungarian people would be at stake, his feelings – that is, his patriotism – would get the upper hand over his rational arguments: “This patriotism, however, is still dormant in me. As certain as it is that I have wiped out of myself any traces of racial hatred, so that besides Oszkár Jászi there are not many who are more tenderly and benevolently disposed towards the national minorities in Hungary than me, so certain it is that patriotism would awake in me in desperate straits and occasions. I am afraid it is not impossible that this desperate situation and occasion will fall upon us more unexpectedly than we would think it.” His fears proved to be a dreadful prophecy. Nine months later the First World War broke out, and everything happened as he had foreseen it. His bourgeois radical friends were led by their reason and kept fighting for general human rights, sometimes even for utopistic aims, while the former enemies of the poet, the men of the aristocratic Hungary whose main representative for Ady was Prime Minister Count István Tisza, behaved as patriots and defended the Hungarian people in the years of the war. Ady’s obscure allusion – “But then I also will have to admit that a Hungarian count of aulic descendance who in the last year would have had every restless Hungarian killed, does not defend his own private dominion but the Hungarian people. It is probable that there will be not many persons like this, but some there will be for sure. But then how could I fight shoulder to shoulder with such people who after the danger will again become as they had been?” – in fact refers to István Tisza. “In the last year”, that is, in June 1912 it was him to oppress with force the obstructing parlamentary opposition. These two representatives of the Hungarian idea fell more or less at the same time, and history stepped over them. 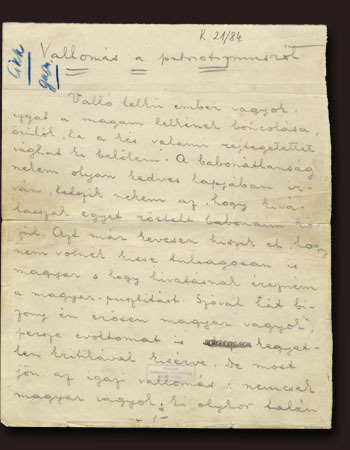 In October 1918, at the outbreak of the “Aster Revolution” Ady kept with his bourgeois radical friends, and although he was already very ill, he participated at the inaugural meeting of the “counter-academy”, the Vörösmarty Academy, and he welcomed the revolution with the poem Greeting to the Winner. This is more or less what the literature usually says about Ady’s activity of 1918. But the history does not end here. At the sight of the fall of the historical Hungary, the disintegration of the country and the anarchy Ady felt disappointed. He thought just as he wrote some years earlier in his Confession, that the Hungarian people and country had to be defended “at any cost”. He was terminally ill, so he could not put to paper these thoughts any more, but several witnesses remember his words. His younger brother Lajos Ady and his attorney Dr. László Farkas equally wrote: “I heard that Ady, when he still was able to wake up, went to the nearby redaction of the Új Nemzedék in Duna street, 15 and there he cried for Transylvania. About the revolution in course he only told: «I thought it differently.»” 16 He probably had thoughts like the ones quoted by Lajos Fülep: “but even the best revolutionary and the most perfect leader is not enough if he has not my Hungarian feelings, because then this revolution will not be the revolution of this people. The two must fall into one, revolutionary leadership and my Hungarian identity.” Several visitors of him remembered that in the last months of his life he was only and with obsession thinking about “his” Transylvania. At the end of his article calls upon his reader to “seek for his own Hungarian patriotism and to examine it; and to proceed in a similar way with every other superstition – or let us simply say sentiment.” This article and personal fate of Ady can be a memento and lesson for our age as well. 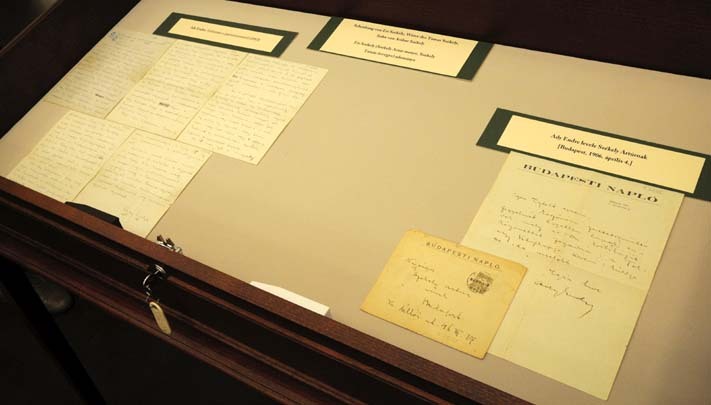 Since the end of December 2009 it is not hidden any more, but it is in the property of the Manuscript Department of the Library of the Hungarian Academy of Sciences. We are grateful for it to Eri Székely, daugther-in-law of Artúr Székely living in Zürich. It was her to donate the five leaves of the Confession to the Library. The document is conserved in the “K” section reserved for the particularly valuable manuscripts, together with the other documents on Endre Ady, under shelfmark K 21/84.